Just six weeks since the last big win, the progressive jackpot at Slotland.com has been hit again for six-figures. The $110,125 win last week brings the total jackpot wins in 2008 to $896,405 (€700,360). Slotland’s jackpot, available on all of the slots and video site’s games, has been hit every 4 – 6 weeks since last summer. While the jackpots aren’t the biggest on the internet -- usually $100,000 to $150,000 -- they are hit so frequently that they are increasingly popular with online slots players. A $168K win on Booster in July, $88K on Wild Heart in May, $91K on the new Four Cast in April and -- the largest win ever -- $195K on Treasure Box in March, bring the total progressive jackpot wins for the year to nearly a million dollars (over seven hundred thousand Euros). With the launch last month of it’s latest game, Megaspin, Slotland.com now features thirteen unique slot machines and three video poker games. Four of the most popular online slot machines and two video poker games are also available on mobile phones and PDAs. All of Slotland’s games give players the option of placing a maximum bet for a chance at the progressive jackpot. All of the slots and video poker games on the mobile network are also tied to the same jackpot pools. 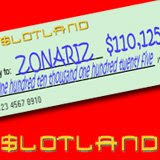 Slotland is available in Spanish at Es.Slotland.com.